We’d love your help. Let us know what’s wrong with this preview of 1,000 Years, 1,000 People by Agnes Hooper Gottlieb. 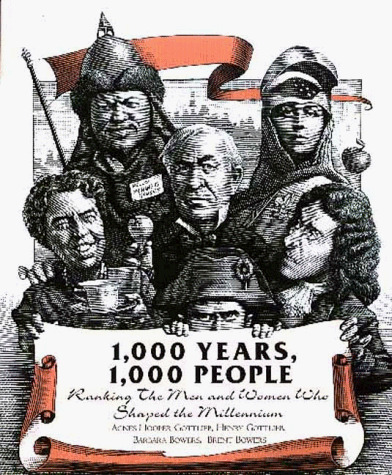 This text presents a list of 1000 of the most important, influential and intriguing figures of the past millennium. Among the figures profiled are philosophers and artists, statesmen and warlords, inventors and explorers. Each person is profiled with a brief autobiography. To ask other readers questions about 1,000 Years, 1,000 People, please sign up. In the first part(1-100) of 1,000 years 1,000 people, it is mainly about the unsung and underappreciated. This part has the most recognizable people from Johannes Gutenberg to Henry the VIII of England. There are mostly scientists, and artists that are extremely famous for their pieces of art and their discoveries which have inspired many back then and still to this day. These people are the beginning behind everything. The others that come after build on top of what they've done, improving the In the first part(1-100) of 1,000 years 1,000 people, it is mainly about the unsung and underappreciated. This part has the most recognizable people from Johannes Gutenberg to Henry the VIII of England. There are mostly scientists, and artists that are extremely famous for their pieces of art and their discoveries which have inspired many back then and still to this day. These people are the beginning behind everything. The others that come after build on top of what they've done, improving the ideas and thoughts for the better. The people that interested me the most were: Pablo Picasso, because he was an art colossus who was said to have worked twenty thousand works that included everything you could imagine, which shows his amazing and endless creativity to then be put into wonderful works of art. I also liked Joseph Marie Jacquard, and her four thousand year ago invention of the loom. Weaving back then was a very slow and painful process because everything was handmade. Joseph wanted to create a machine in order to make weaving much safer and faster. In conclusion, these two people put a lot of thought and effort into doing what they do which is why they inspired me the most in part one(1-100). This is an interesting book. 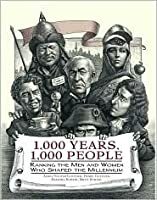 This book is about people in the millennium, ranked from 1 to 1000. This book is a two-column book. It gave a small summary of each person. In the book their are some people you might know are in this book, such as William Shakespeare ranked #5, Susan B. Anthony ranked #139 or even Elvis Presley ranked #352. But throughout the book their were plenty of people that you most likely haven't heard of like Godfery Newbold Hounsfield the person who came up with a CAT scan, This is an interesting book. This book is about people in the millennium, ranked from 1 to 1000. This book is a two-column book. It gave a small summary of each person. In the book their are some people you might know are in this book, such as William Shakespeare ranked #5, Susan B. Anthony ranked #139 or even Elvis Presley ranked #352. But throughout the book their were plenty of people that you most likely haven't heard of like Godfery Newbold Hounsfield the person who came up with a CAT scan, or Thomas Hopkins Gallaudet the 1st schoolmaster to the deaf. This book was a book I liked because of the new people I learned about. I belive this book was ment for people who like to agree to disagree. For example you would think that something should be ranked higher but is not like Giuseppe Fiorelli the first person to discover dust. Yes that did help with keeping ourselves clean but it isn't something that should be ranked in the 600's, compared to a woman who created jazz that was ranked in the 900's. Which I obviously disagree with. Also the book started to get boring once you get to the 600's and 700's. A unique compilation of the most famous and infamous men and women who left their mark on the world stage during the past mellinnium. I particularly found it interesting that the authors included those known for their evil deeds as well as those whose deeds benefited mankind. I was very surprised to discover how many individuals included in this work I had never heard, but probably should have. I think I got to number 563 out of 1000 people listed in the book, and I just couldn't do it...it stopped being interesting when I stopped recognizing the historical figure. Love this book! I always like "top ten" lists, and this takes it to a whole other level as you can debate the merits of the contributions of famous people over the last 10 centuries. great tidbits of info. don't get hung up on the rankings! 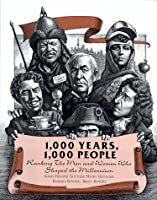 An interesting take on the big shots of the last 1,000 years. After 327 people, I became a bit bored. It was very interesting though to learn about these people and the difference they made.